The plague of long-run unemployment is one of the worst consequences of the aftermath of the Great Recession, as I have noted here, here, and here. 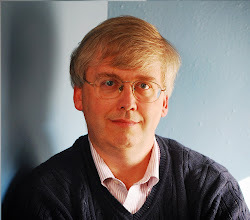 David Neumark and Patrick Button present evidence that this burden is shouldered primarily by older workers in "Age Discrimination and the Great Recession," discussed in the Economic Letter of the Federal Reserve Bank of San Francisco for April 7, 2014. One way to measure long-run unemployment is to look at the average length of time that an unemployed worker is out of a job. From 1990 up to the start of the Great Depression, men and women aged 55 and over tended to be out of work longer than unemployed workers in the 25-54 age bracket, but the difference typically wasn't very large. 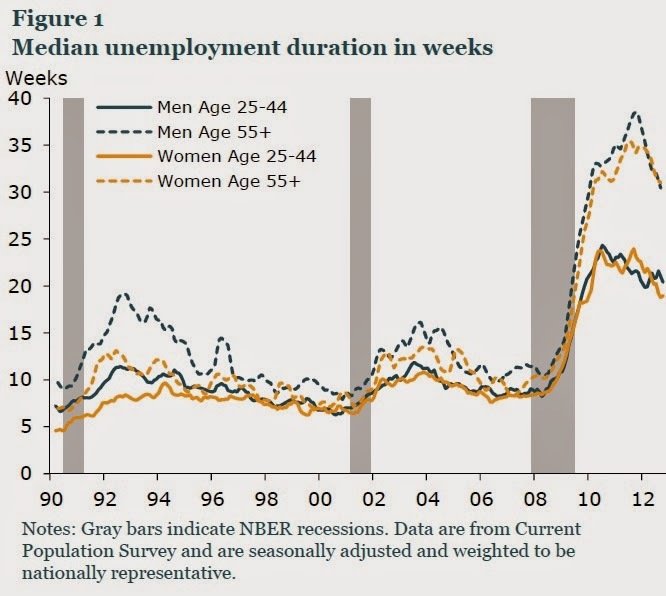 But after the Great Recession, the duration of unemployment rose to over 20 weeks for those in the 25-54 age bracket, but to about 35 weeks for the unemployed in the 55 and over age bracket. in Employment Act originally passed in 1967 and then amended and strengthened several times since then. However, states are allowed, if they wish, to enact age discrimination rules that are stronger than the federal standard. For example, the federal law only applied to employers with 20 or more employees, but 34 states have set lower size minimums. Similarly, federal age discrimination law only allows for "liquidated damages," which means wage losses that actually occurred, while 29 states also allow for compensatory or punitive damages. "Thus, we find no evidence that stronger age discrimination protections helped older male workers weather the Great Recession better than younger male workers. In fact, some evidence indicates that stronger state age discrimination protections may have made things relatively worse for older male workers. For women, the evidence is more mixed. On one hand, some evidence suggests that stronger age discrimination protections were associated with relatively smaller increases in the unemployment durations of older women during the Great Recession. On the other hand, in the period after the Great Recession, states with stronger age discrimination protections had larger declines in the hiring rate of older women." An event like the Great Recession disrupts the labor market so severely that sorting out which effects are due to age discrimination and which to worsening business conditions becomes very difficult. These complications may make it hard to demonstrate age discrimination, reducing the likelihood that the legal system can intervene effectively and fairly. States with stronger age discrimination laws impose constraints on employers. Thus, there could be what might be described as a pent-up demand for age discrimination in these states. A sharp downturn gives employers cover to engage in age discrimination. During and after the Great Recession, business conditions and the need for labor may have been so uncertain that employers became especially wary of hiring older workers. They may have feared that if they had to lay off older workers, they would face wrongful termination claims based on age. Such claims could be more likely or more costly in states with stronger age discrimination laws. It's not clear what policies would best address the additional burden of longer-term unemployment on older workers. The situation is a reminder that when laws are passed which make it more costly to fire or to lay off workers, such laws are also by definition a disincentive to hire that category of workers in the first place. It's often tricky to prove age discrimination in the case where workers are fired, but it's even more difficult to prove such an employment discrimination case related to an unwillingness to hire older workers. After all, if a firm announces that it is hiring lots of entry-level workers, or workers at salaries typically paid to those who are 30 years old, rather than hiring lots of workers at the wages typically paid to those who are 55 or 60 years old, such a policy will make it harder for older workers to get a job but may not fit the legal definition of discrimination.